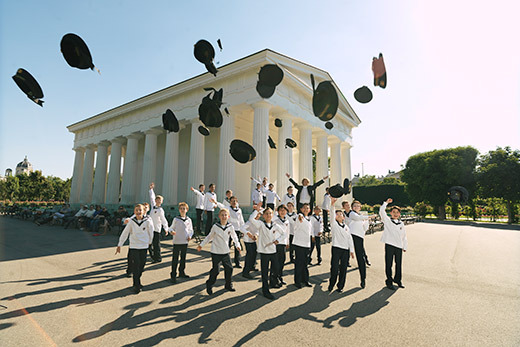 The world-renowned Vienna Boys Choir performs Oct. 24 in Emerson Concert Hall, part of a diverse slate of musical performances on campus this month. Photo by Lukas Beck. This October, Arts at Emory features a wide range of events to enjoy, including a diverse slate of musical performances and several ways to get in the mood for Halloween. The Emory Creative Writing Program presents Oprah’s Book Club author Ayana Mathis in the Phillis Wheatley Reading, Tuesday, Oct. 3, at 6:30 p.m. in the Woodruff Library’s Jones Room. A colloquium with Mathis follows on Oct. 4 at 2 p.m. in the Callaway Center. Both events are free and open to the public, co-sponsored by the department of African American Studies and the Hightower Fund. Emory Film and Media Studies continues the fall Cinematheque series, “Resisting Fascism,” Wednesdays at 7:30 p.m. in White Hall 208. This month’s film screenings include “The Stranger” (1946) on Oct. 4, “Naked Among Wolves” (1963) on Oct. 11, “Army of Shadows” (1969) on Oct. 18 and “The Conformist” (1970) on Oct. 25. The Michael C. Carlos Museum presents an Ancient Grains Cooking Class with Atlanta chef David Sweeney of Dynamic Dish and Cakes and Ale, Thursday, Oct. 12, at 7:30 p.m. Sweeney will share techniques and recipes for centuries-old grains including amaranth, whole berry kamut, quinoa and millets. Continuing a month of culinary adventures, the Michael C. Carlos Museum presents Halloween treat “Mummies and Mixers” on Thursday, Oct. 26, at 7:30 p.m. and the family-friendly “Twelfth Annual Mummies and Milkshakes” on Saturday, Oct. 28, at 6 p.m.
Staibdance joins the Vega String Quartet, Ben Coleman and Kendall Simpson for “Staibdance: Wishdust,” an examination of all that never was, Oct. 19-21 in the Dance Studio of the Schwartz Center for Performing Arts. Tickets are $20; $15 discount category members; $8 students. They are on sale through the Arts at Emory Box Office. Theater Emory presents a blood-drenched, rock ‘n’ roll nightmare inspired by the works of Bram Stoker, “The Anointing of Dracula: A Grand Guignol,” Oct. 26 – Nov. 5. Theater Emory offers free admission for audience members dressed in costume on Halloween and for the 11 p.m. performances Oct. 28 and Nov. 4. This show is for mature audiences only. October offers a particularly diverse schedule of musical performances on campus. All take place in the Schwartz Center for Performing Arts' Emerson Concert Hall unless otherwise noted. Join the Department of Music for outdoor jazz performances on Patterson Green at Jazz on the Green Oct. 5 and Oct. 19 at 6 p.m. The 2017-2018 Candler Concert Series commences Saturday, Oct. 7, at 8 p.m. with pianist Alessio Bax and violinist Chee-Yun in a program that includes Beethoven, Busoni and Brahms. The series continues Oct. 22 at 4 p.m. with the Vienna Boys Choir, world-renowned for their rapturous harmonies, celestial voices and a wide-ranging repertoire spanning centuries. In a special Family Weekend concert Oct. 20 at 8 p.m., the Emory Wind Ensemble presents the world premiere of celebrated filmmaker and Emory alum Nikoloz Kevkhishvili’s newest film “In Her Image,” with an original score by Richard Prior, conducted by Paul Bhasin. Following the screening, five brass soloists of the Atlanta Symphony Orchestra perform together in a special rendition of Leonard Bernstein’s “Mass” in celebration of the Bernstein Centennial. On Saturday, Oct. 21, at 8 p.m., the Emory Concert Choir celebrates Eric Nelson’s 20th anniversary as the ensemble’s director. The Emory University Symphony Orchestra and Emory University Chorus unite to celebrate the 500th anniversary of the Protestant Reformation with Bach’s Cantata No. 80 and the Finale of Mendelssohn’s Reformation Symphony on Oct. 26 at 8 p.m. The Emory Chamber Music Society of Atlanta presents “Jazz Meets Classics – Songs of Love,” Oct. 28 at 8 p.m. Tenor Bradley Howard and pianist William Ransom perform songs of love by Schumann, Rachmaninoff and Puccini interspersed with romantic jazz favorites by vocalist Johnaye Kendrick and Gary Motley on the keyboard. The event is free. For more details and a full schedule of events, visit the Arts at Emory website.